Did you know that pork is a red meat? This means that it’s best to rest once cooked and it’s perfectly OK with a hint of pink – just like beef and lamb. 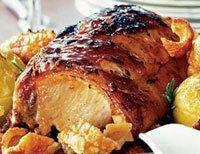 In fact cooking it this way means your pork will remain succulent and tender – perfect! Pork mince binds to itself, so it’s great for meat balls!